The video sharing wars are on and the swords are drawn. The latest salvo has been fired by Facebook which today announced video sharing support for Instagram that too for both Android and iOS devices. Instagram has been a proven hit when it comes to sharing photographs with your friends, colleagues and loved ones albeit filtered. And the big ticket announcement by Facebook, which by the way many had already forecast was the announcement of Video on Instagram for Android and iOS devices. For Instagram users the more the merrier and videos are a good way to share another of your escapades with friends. Another thing Facebook has done is, it has made this video sharing surprisingly easy. So now when you're getting ready to take a photo on Instagram, you'll have the option to enter the video mode too. Click on the movie camera icon, and you can take an entire video or several sections for a total of 15 seconds. When you think of Instagram, you think of filters and the videos too have filters. A total 13 brand new filters for videos named Stinson, Vesper, Dogpatch and more. The user can also select the frame which they think will make the video more elaborative and enticing. The iPhone 4S and iPhone 5 get a feature called Cinema which uses advanced stabilisation effects to give you nearly-perfect looking video even if you have shot the video running around or your hands are shaking. Another plus to Instagram video is that the video will not start playing till you have lifted your finger off it. My only grouse is the 15 second limit. Why on earth do they need this second limits when the world is moving into minutes and hours. 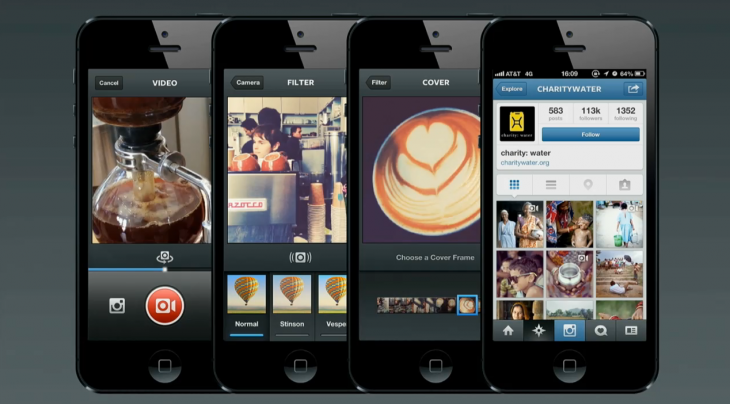 Download the updated Instagram with video for iOS devices from Apple Store.